Nancy grew up in Dorset, Vermont where she developed a love of classic, New England home styles. She studied at Parsons School of Design and worked at Kohn Pedersen Fox Architects in New York City. Upon moving home to Vermont Nancy worked for Goldsmith & Morris Architects in Burlington. 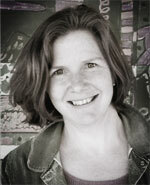 Nancy Leary Design was established in 1990. Work has primarily included new fine home designs in Vermont, Connecticut, Massachusetts, New York, Georgia and New Hampshire. Nancy has worked in the hospitality design field on such projects as the Fort William Henry Grand Hotel, the Bally’s Casino Hotel and Pierre Hotel. Nancy was responsible for many of the rejuvenation projects in Brandon, Vermont including the Warren Kimble Gallery, the Brandon Artists Guild and the Briggs Carriage Bookstore. Nancy works in the historic Conant Block in Brandon, Vermont which she purchased and renovated with her husband, Jim in 2003.